Written in an accessible but scholarly manner, this is the first British-edited and authored collection on lesbian and gay psychology. Adrian Coyle is Senior Lecturer and Joint Course Director of the Practitioner Doctorate in Psychotherapeutic and Counselling Psychology in the Department of Psychology at the University of Surrey. Celia Kitzinger is Professor of Conversation Analysis, Gender and Sexuality in the Department of Sociology at the University of York. Both editors are well-established in the field of lesbian and gay psychology. Foreword: The Cutting Edges of Lesbian and Gay Psychology: Anthony R. D'Augelli, Pennsylvania State University. 1. Introducing Lesbian and Gay Psychology: Celia Kitzinger, University of York, and Adrian Coyle, University of Surrey. 2. Developmental Issues for Lesbian and Gay Youth: Ian Rivers, York St John College. 3. Girls' Friendship and the Formation of Sexual Identities: Christine Griffin, University of Birmingham. 4. Coming Out as a Lesbian: Laura A. Markowe, south Bank University. 5. Lesbian and Gay Parenting: Fiona Tasker, Birkbeck College, University of London. 6. Resistance and Normalization in the Construction of Lesbian and Gay Families: A Discursive Analysis: Victoria Clark, Loughborough University. 7. Lesbian Health: Sue Wilkinson, Loughborough University. 8. Gay Men's Physical and Emotional Well-Being: Re-Orienting research and Health Promotion: Ian Warwick and Peter Aggleton, both University of London. 9. Psychopathology and the Social and Historical Construction of Gay Male Identities: Gary Taylor, University of Sussex. 10. Lesbian and Gay Affirmative Psychotherapy: Defining the Domain: Martin Milton, University of Surrey, Adrian Coyle, University of Surrey, and Charles Legg, City University. 11. Family Therapy with Lesbian and Gay Clients: Maeve Malley, Birkbeck College, University of London, and Damian McCann, Edgware Community Hospital, London. 12. ‘I've Always Tolerated It but: Heterosexual Masculinity and the Discursive Reproduction of Homophobia: Brendan Gough, University of Leeds. 13. Student Support for Lesbian and Gay Human Rights: Findings from a Large-Scale Questionnaire Study: Sonja J. Ellis, Sheffield Hallam University. 14. Lesbian and Gay Awareness Training: Challenging Homophobia, Liberalism and Managing Stereotypes: Elizabeth Peel, Loughborough University. 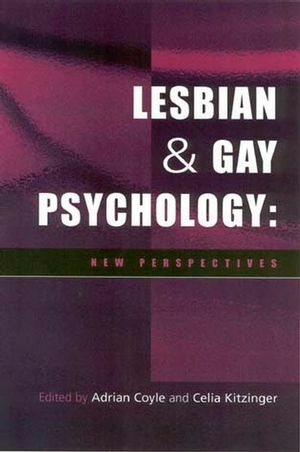 Winner of the 2003 Award for Distinguished Book in Lesbian, Gay, and/or Bisexual Psychology from the American Psychological Association's Division 44 (the Society for the Psychological Study of Lesbian, Gay, and Bisexual Issues). ‘This is an important work of scholarship, which is both a historical milestone and a signpost to the future. Above all, it is engaged in a dialogue with its readers and that can only be of benefit both to the psychological profession and to the lesbian and gay community.' Professor Jeffrey Weeks, Dean of Humanities and Social Science, South Bank University, UK. Leading names in the field discuss a broad range of concerns cutting across social, health, developmental, educational and counselling psychology. Outlines some of the characteristics which have distinguished the struggle to legitimise lesbian and gay psychology on a local as well as an international level. Explores both feminist and critical perspectives and uses of qualitative as well as quantitative methodology. Topics include development during adolescence, girls' friendships, identity formation and disclosure, parenting and family issues, health issues, psychotherapy and social attitudes.